We are interested in different styles of collaboration and are looking for partners across the globe! The most correct way to classify uCoz is to call it SaaS. uCoz is one of the largest web services of the Russian-language Internet and Eastern Europe in general. 5-year e-market presence has truly become a success story. uCoz has not only won the loyalty of over 1 million international users, but also became a laureate of several prestigious internet awards. 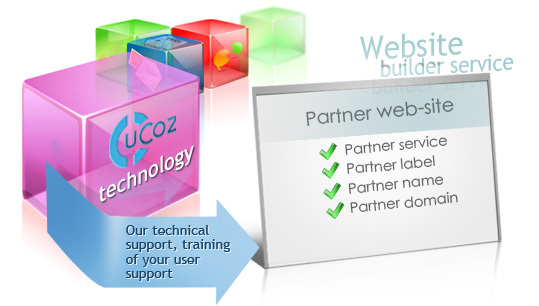 uCoz White Label is a B2B solution for web services and portals, which provides them with an opportunity of getting a website builder under their own brand for their users. It certainly can bring a great value to both well-known established projects and young, active and ambitious startups. According to the white label scheme, we commit to carry out all the technical duties: servers maintenance, providing software, upgrades, coaching technical support members. You will be able to customize the product according to your vision and marketing strategy. 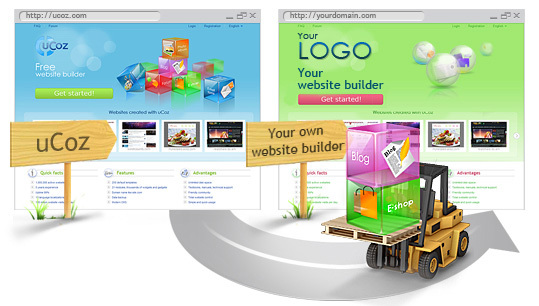 additional services like selling domains, games etc. We are looking for a distributor in the German Internet Market! We welcome any kind of synergy and are open to any sound proposals. We are always interested in promoting our product, holding ingenious contests, stimulating our partners' progress and supporting mutually productive relationships. We are willing to make money together, be it via advertising or supplementary services. Perhaps collaboration with your project can become a start of something new and mutually beneficial.